When my Mother passed away over ten years ago, my father let me keep her jewelry box. I had always played with her jewelry as a kid, and so it kind of fit that I would inherit it. In that box were lot of sparkly bracelets and rings. But in this one special compartment I found something else. Something my Mother had packed away--a symbol-- to remind her of a specific time and place, or a certain kind of struggle. Why it was tucked away in a jewelry box, of all places, I'll never know. 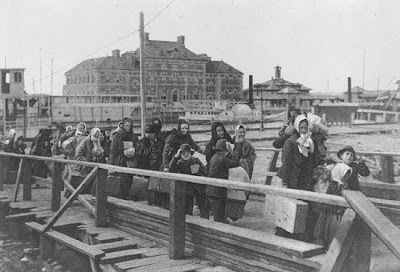 See, my parents came to Ellis Island in the 1960's from Eastern Europe, poor and broken, but hopeful. They had to learn a new language and integrate a new culture. So last week when I saw my son playing with my jewelry and opening my mother's box, I felt warm and fuzzy. Then he held up my Mom's special symbol, one that I had long forgotten, with a puzzled look on his face. It was a lone piece of bread she had set aside for their journey to this country, just in case they needed it. 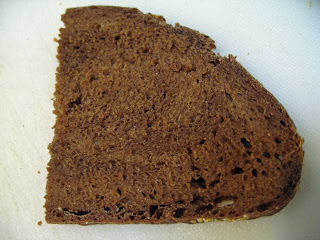 A piece of dark brown pumpernickel, now aged forty years, and hard as a rock, left in a plastic bag. That bread had made quite a journey, and I cannot bear to ever dispose of it. So back in the special compartment it went. A story to always be shared. If I were writing a book about my parents, that bread would be symbolic. Much as the Mockingjay was used in The Hunger Games, and the Phoenix in Harry Potter, and on and on. I use certain symbols in my books (gloves and stones, for example)- some I hadn't even realized until they were pointed out. They add another rich layer of meaning, something for the reader to latch onto and remember. 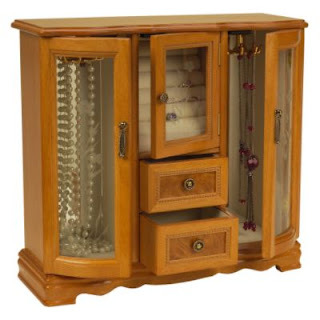 What a fantastic story, the bread in the jewelry box. Gorgeous story about your parents and the things she saved:) Such a precious thing to have. I have symbols coming up in the current WiP, but there has always been one that no matter what the story evolved into over the year it remained the same. A Monarch. There's a special meaning for me behind the butterfly and I have managed to work it in each time I dump and start over. What a great story. My grandparents came to the US by way of Ellis Island too, and it still amazes me. Wow. Almost in tears over that piece of bread. I need to share this story with my girls, as their elementary school gym is "transformed" into Ellis Island each year. The kids dress as "immigrants", go through physical and mental tests, and some are "deported" back to their classrooms. But nothing is more real than that one piece of bread. Makes me catch my breath. Such an amazing story. That's an incredibly important keepsake to have. That's a sad but beautiful story. I'm sorry for your loss. Symbolism is like the key that unlocks the chest of theme. I love it when I read it, but I have a hard time making it work well in my own writing. That's what life is all about -- not the flashy expensive stuff, but what carries someone through their trials. You lucky, lucky, lady. For future generations, I'd put a little note inside the bag so it NEVER gets thrown out. Thanks for sharing. What a beautiful story! I'm not surprised that you keep it near and dear to your heart! It's more than just a piece of bread "just in case", it like a piece of their hopes and dreams too! You're so lucky to still have a piece of that treasure! I know your mom would be so proud of you that you're also living out your dream! That is such a poignant story -- thank you for sharing it, Christina. Symbols can play such an important role in life and in novels. wow - i truly enjoyed reading this. symbols make stories so much more interesting. it adds more layers to what each person can get out of it. What a lovely story, thanks for sharing! Wow, this is a great memento. I like that something simple can hold such a powerful memory. There are things we keep as mementos. They mean nothing to anyone but us, and maybe our kids if they know about them. I think it's a great heirloom to pass to your kids. What an incredible piece of awesome from your mother! I love that story. Wow...how cool. To my first-generation Friend: thanks for sharing your truth. Amongst bittersweet memories the bread endures. Love that now EAL is now privy to the story. That is beautiful! Thank you for sharing it. I've always loved seeing symbols in books, and I can only hope I've left some interesting ones in my own writing. Wow, that is fascinating! Our parents have so much to tell us and share with us. I'm glad your mom shared before she was gone, and even that little "memento" is cute (though unusual).